We are living in the time of the prophecies. December 21st 2012 marked the end of many major earth cycles and we now stand on the brink of a new way of being. Amongst the great changes that are taking place, it has been said that are bodies are becoming more crystalline in form, to help us integrate the crystalline frequencies of the higher dimensions. 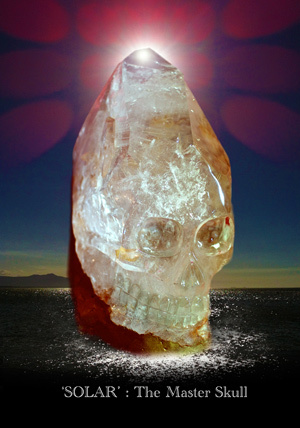 It’s very interesting to note therefore, the emergence of the Crystal Skulls into mass consciousness at this time. My personal journey with the Skulls began seven years ago in Mexico and has taken me to many sacred places across the globe. Never have I experienced however, anything like the dynamic energy of ‘reunion’ I felt on June 22nd this year in Mt Shasta, California, when I met the incredibly powerful Crystal Skull Being called ‘The Master Skull Solar’. Interestingly, it happened to be my birthday that day too! 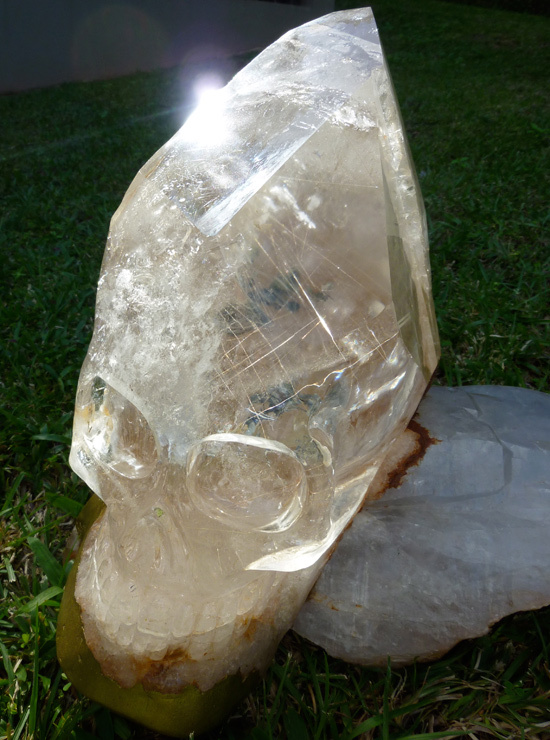 ‘Solar’ is a unique and extraordinary 33-kilo Quartz Crystal Guardian and Master of untold power. His actual crystal form is that of a huge double-terminated Lemurian crystal filled with Golden Rutile, which in itself is highly unusual. He also has a single ‘Angel Wing’ – a tabular platform of clear mother quartz, which was part of his original stone matrix. I understood immediately, that the Being who is ‘Solar’ has offered himself to be of assistance to the world at this time. ‘Solar’ has demonstrated to me beyond doubt, that he is the conduit of information and energy from Higher Dimensional realms. I have been deeply touched to witness the impact he has already made on the lives of others. In many cases this impact has come through people merely seeing his image. I have also watched with awe, the extraordinary visual phenomena ‘Solar’ has demonstrated in photographs, since he has been with me. Just two days after ‘Solar’ came into my keeping, I travelled to Santa Cruz with a friend who works intimately with the steward of the newly discovered Andara Crystals. The purpose of our visit was to work with these crystals. ‘Solar’, all 33 kilos of him, made it very clear that he wished to accompany me, something not without its challenges as you can imagine! It soon became evident why he wished to be there. Two sets of photographs Laura took while ‘Solar’ and I were working within the Andara Crystal Labyrinth were absolutely astounding. In one, etched like a finely detailed painting inside his tall crown, the head of a St Germaine-like presence appeared. (Interestingly St Germaine’s energy is considered to be synonymous with Mt Shasta). In the second set of photographs, Solar appeared to have Human Eyes, as well as showing another ‘presence’, above his right eye. 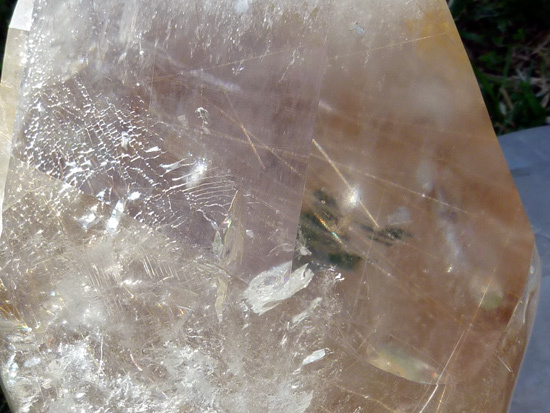 Many other photos taken since then, have shown a great variety of spirit presences within this Master crystal. ‘Violet Flame’ energy of St Germaine? So what is the meaning of these Spirit Beings showing up inside this unique crystal? I think it says a few things…. 1) That ‘Solar’ acts as a kind of multi-dimensional portal to allow Higher Dimensional Beings to connect with us in a very tangible and visible way. On seeing some of these photos, clairvoyant Brenda Vong was told by Spirit that ‘Solar’ is transmitting information from several major Ascended Master Councils, including the Great White Brotherhood of whom St Germaine is a member. “It is very interesting how the skulls reveal themselves. Solar came in a large batch of rutilated quartz from Bahia in South Eastern Brazil. This skull was differentiated in the piece I call the master batch. The initial idea was to sell the stone, but it was then in that natural rock, that I saw ‘Solar’ was stored. 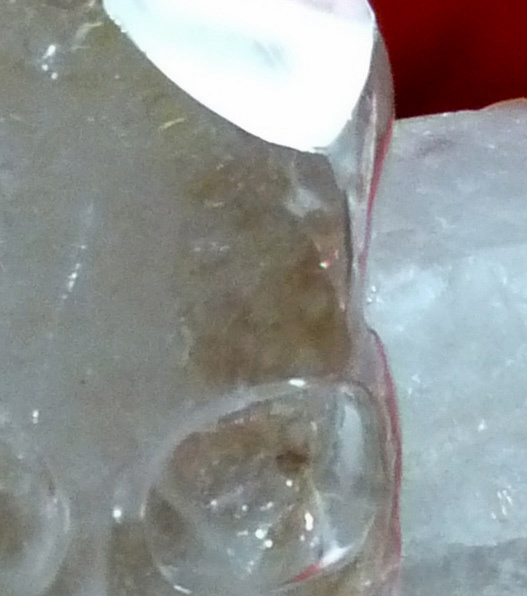 A skull always pleads to me for help to be seen – to have their powerful quartz activation revealed. I carved open the face of ’Solar’ so that he could be seen for this world. But when I opened the face of this skull, he was not yet activated. Sometimes a skull can wait for years to find their guardian, as in the case of ’Solar’ and Lia. ‘Solar’ remained with Leandro for almost six years after he carved him. Then in February 2012 he told Leandro that he wanted to go to Mt Shasta. Strange as it may sound, he was we now know, getting himself into place to meet me there in June, in readiness for our work together! I think it’s no accident either that by the time of the 2012 Total Solar Eclipse, ‘Solar’ was ensconced in his new home in Cairns, Australia which was the one place in the world were he could sit under the eclipse in its full ‘totality’! Two days after reading the information from Leandro, I received a ‘Metatron’ channelling from James Tyberon, which spoke about Crystals and their critical purpose at this time. 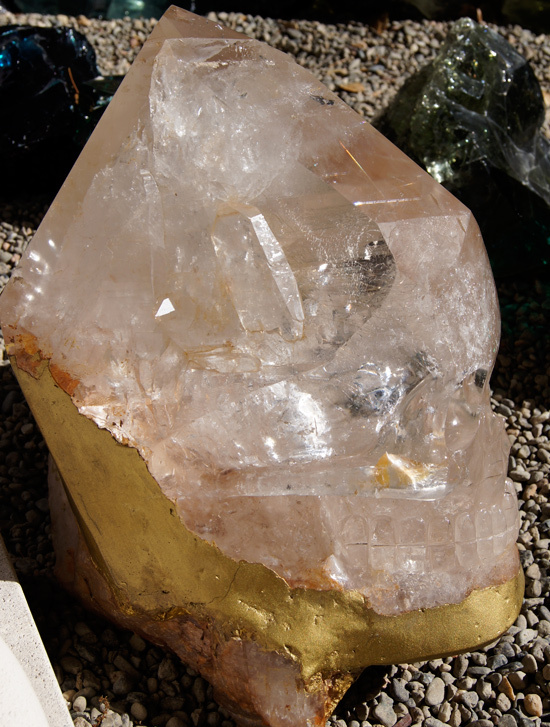 “Crystals are great receivers and transmitters, and a strong communication network occurs between Master Crystals and indeed Crystal Vortex-Portals. The two most powerful Crystal Vortexes on the planet are Arkansas and Brazil. 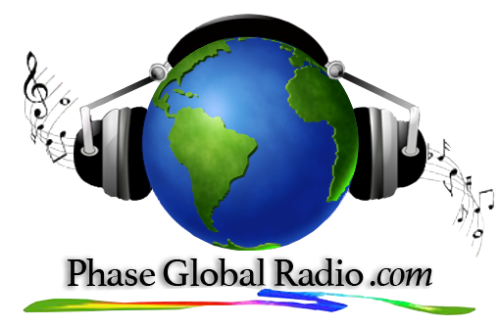 As such, the connection of the Arkansas portal to the Brazil portal is extremely important in the Ascension and global crystal network. 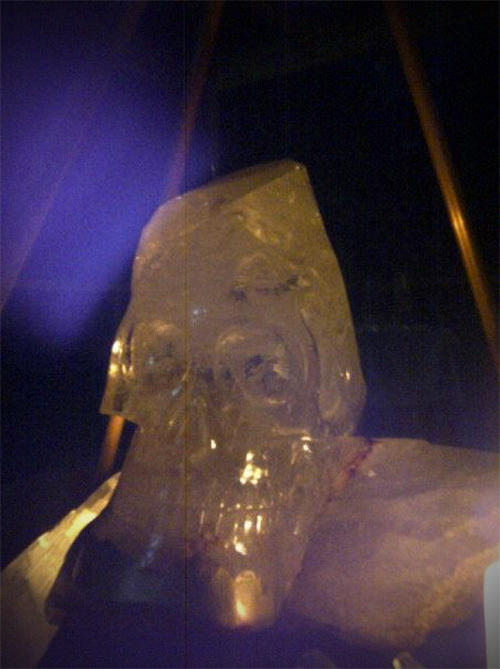 ‘The Master Skull Solar’ originates from the Bahia region of Brazil, which Metatron describes as being one of the most powerful Crystal Vortexes in the world and the location of one of two Master Crystal Temples. I knew from the moment I ‘re-connected’ with Solar, that he was a Master Being. This Metatron information confirmed that intuitive knowing. Due to ‘Solar’s great size and weight there are few opportunities for people to meet this unique Crystal Master ‘in person’. ‘Solar’ generally works through me, transmitting to the world through the music and sound codes I bring forth. He is an incredibly powerful being however and his reach is widespread. As I mentioned, many people have reported being activated, purely by seeing his image. This prompted me to have two posters made so that people could meditate with ‘Solar’ within their own sacred space, and receive the energy and information from him in a more tangible way. ‘Solar’ displayed his power yet again, during the creation of the posters! The first poster backdrop photo was taken on a magnificent sunny day on the road to Yarrabah, outside Cairns. The sun was shimmering on the water and there was a magical clarity of energy present. When I downloaded the photos my jaw literally dropped…the sky had turned to Indigo and the sun appeared surrounded by huge and beautiful pink petals! It was as if the sun wanted to make a powerful and dramatic statement about its namesake – the incredible Master Being ‘Solar’. T he second backdrop photo was taken on the road to Atherton as the sun was setting and the sky filled with the most exquisite golden light. There was a clear winner again – one photo had a huge purple orb present, right beneath where Solar is now positioned! 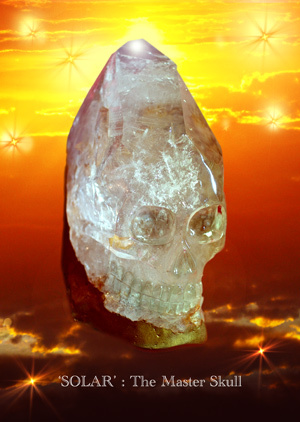 I believe ‘The Master Skull Solar’s’ gift on that date was to activate those present, into a connection with the 144 Crystalline Grid of Consciousness said to come into completion at that time. At that significant moment in time ‘Solar’ provided an opening for us to receive the energy from the crystalline realms.12.12.12 was a precursor to the 21.12.12 Winter Solstice that saw the completion of many major earth cycles. So the 12.12.12 event was indeed an opportunity for ‘Crystal Illumination’, as we moved forward toward the very brink of a New Age. In recent months ‘Solar’s’ work with me has entered a new phase. In June 2013, under guidance from Spirit, I embarked on an Australian tour which I was told to call the ‘Sounds of Source Tour’. ‘The Master Skull Solar’ is an integral part of this project, the purpose of which is to assist people in adapting to the physical, mental and emotional challenges presenting as a result of the massive increase in ‘Solar’ flares and geomagnetic activity coming into our planet. During the ceremonies, I make myself available to transmit Transformative Starseed Sound Codes from Source. Guidance I have received has intimated that those who receive thes coded healing frequencies coming through my voice, will be in a much better position to benefit from the intense Solar energy currently bombarding the planet. With the assistance of ‘The Master Skull Solar’s’ energy, these sound codes act as the catalyst for awakening, helping to open the hearts of those present, and allowing them to receive the gifts being offered. Self-Love…Joy…Illumination…and realization of our own Divinity…these are gifts being offered to us at this unique, precious and momentous moment in humanity’s history. So let us enter this Gateway with open hearts and open minds. And with the assistance of ‘the Master Skull Solar and all the Higher Dimentional energies who work with and through him, let us make a vow to ourselves and to each other, to embrace all that we are, and all that we are becoming. 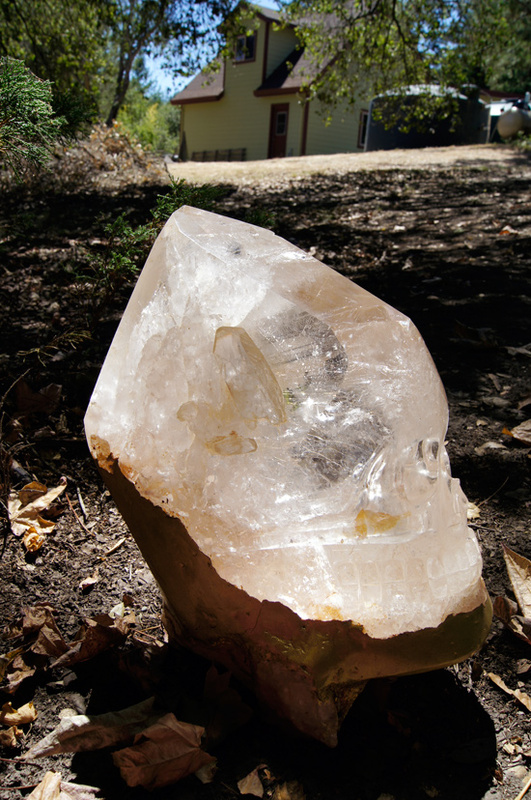 Lia Scallon is an award-winning Composer, Singer, Sound healer and Crystal Skull caretaker. Her catalogue of ten albums of sacred music and meditations are available worldwide through her ‘Sounds of Sirius’ label, www.soundsofsirius.com Her new album ‘The Luminous Pearl’ is currently under consideration for Best New Age Album in the 2013 56th Grammy Awards.